The Cat® 315F is a productive and versatile solution for medium duty applications. Its compact radius design allows you to work in tight spaces without compromising performance. The powerful hydraulic system increases productivity, making the 315F excavator a top performer in the 15-ton size class. • Increase productivity and get the job done with a powerful and efficient negative flow control hydraulic system. Major components are located close together creating less friction, reducing pressure drops, and increasing power to the ground. • The Cat C4.4 engine using ACERT™ technologies can run on biodiesel up to B20 and meets U.S. EPA Tier 4 Final and EU Stage IV emission standards. • Two power modes—eco and high power—help you manage fuel consumption. • Lower your load point and maximize the power built into the boom cylinders. The power link between the stick and bucket, with an integrated lifting eye, is designed for heavy-duty lifting over the long haul. • Reduce engine speed and minimize fuel consumption during no-load or light-load conditions with automatic engine speed control (AEC)· • Optional engine idle shutdown allows you to set intervals so you don’t waste fuel. • Work at altitudes up to 2300 m (7,545 ft.) above sea level without de-rating. • Save energy and improve fuel efficiency with boom and stick oil regeneration. This feature improves controllability, increases productivity, and reduces operating costs. • Don’t let the temperature stop you from working. Standard cold start capability is -18°C (0°F) and an optional cold start package of -25°C (-13°F) is also available. • Work confidently in space-restricted areas. Dig, swing, and dump within a working space of 3.8 m (12’5”). • Reduce the front swing radius and increase lift capacity with the boom positioned toward the center of the machine. • Increase productivity while working in narrow and restricted spaces with an optional power offset boom which allows you to load and dump from the same position. • Transition quickly between attachments with optional auxiliary hydraulics. 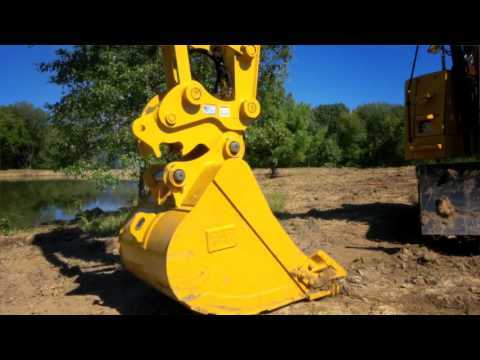 • Expand your work capabilities with attachments for a variety of applications including breaking rock in quarries, preparing trenches, taking down bridge pillars and reinforced concrete on road jobs, and moving and handling brush, rock, and debris. • Cat dealers can install hydraulic kits to properly operate attachments, maximizing machine uptime and profits. • Count on your machine to withstand wear throughout the years. Boom, sticks, and other high-stress areas are reinforced with thick multi-plate fabrications, castings, and forgings to ensure quality and reliability. • Thick chrome plating used on the front linkage pins provides high wear and corrosion resistance. The long pins distribute load weight to elongate pin, boom, and stick life. • Protect your moving parts with the Grease Lubricated Track (GLT) undercarriage. Keep water, dust, and debris out and grease sealed in while prolonging wear life and reducing travel noise. • Bottom guards protect machine components that may be damaged while swinging. • Maintain track alignment and improve overall performance while traveling or working on slopes with guide guards. • The upper frame uses specially designed mountings to support the heavy-duty cab and the lower frame is reinforced to enhance component durability. • You are supported. The Cat Dealer Network is there to provide assistance when you need it. • Check coolant, hydraulic oil, and engine oil levels from the comfort of the cab with a pre-start monitoring system. • Easily reach and quickly replace the protected fresh air filter located on the side of the cab. The door can only be locked and unlocked using the engine key. • Check and service your machine faster with many ground-level routine service and maintenance points. Grouped filters and wide service doors allow easy access to the radiator, pump, air cleaner, and engine compartments. • Change your oil without the use of tools with the incorporated engine oil drain valve. • Eliminate manual priming and reduce the risk of fuel contamination with an electric fuel priming pump. The pump prevents unfiltered fuel from being backfilled during filter changes. • Blowing out debris is easy with wide clearance between the radiator, oil cooler, and air conditioning condenser. • Product Link™ collects data automatically and accurately from your assets – any type and any brand. Information such as location, hours, fuel usage, productivity, idle time, maintenance alerts, diagnostic codes, and machine health can be viewed online through web and mobile applications. • Boost productivity with optional Cat Grade Control 2D Depth and Slope. Real-time bucket tip positioning and cut and fill data on the cab monitor to guide you to grade, saving money on fuel and materials. • Work comfortably in the spacious, quiet cab with automatic climate control; an adjustable, heated seat increases comfort and reduces operator fatigue. 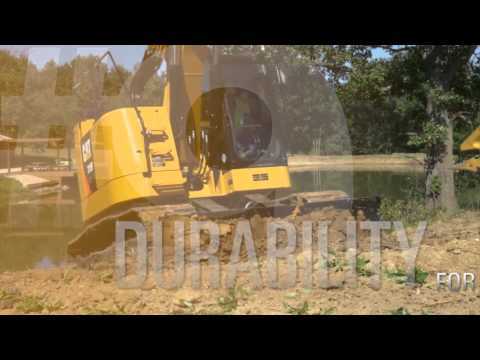 • Control the excavator comfortably with easy to access controls and switches. • Adjust the joystick consoles and armrests to a comfortable position. • Navigate quickly on the standard LCD monitor which is programmable in 44 languages. • Stow your gear with plenty of in-cab storage in the front, rear, and side consoles of the cab. A cup holder, document holder, and coat hook are also provided. • Keep your personal devices conveniently charged using the standard 12V-5A power port. • Rollover Protection Structure (ROPS)-certified cab provides a safe work environment. • A bucket-to-cab avoidance feature helps keeps you safe when working in narrow and restricted spaces. • Enter and exit the cab and walk on the upper structure safely with multiple large steps, extended handrails and anti-skid plating which are meant to reduce slipping and tripping. • Increase visibility with a standard rear-view camera and mirrors. The camera is integrated into the counterweight to protect against damage. • Stay safe in an emergency situation. The skylight and 70/30 front window function as emergency exits. • The hydraulic activation lever lock cuts the pilot pressure for the control levers, preventing the operator from starting the engine when in a locked position. • Shut the engine down quickly and easily in the event of an emergency with a secondary engine shutoff switch. • Protect yourself from overhead impact with the optional Falling Objects Guarding System (FOGS) and other attachments available from your Cat dealer. Take a look at the 315F side by side with other models. Browse through these photos and videos for a closer look at the 315F and what it can do for your operation. Explore the 315F in all its glory through the best 3D and 360° experience in the industry. View key features and benefits and picture yourself in the machine at the jobsite before ever walking into a dealership. Wherever you want to go from here, the 315F is ready. You can get in touch with us in a variety of ways. Check out our inventory of new, rental and used equipment. Connect with your local dealer, ask our experts for advice or read what's happening in the customer forums.